According to statistics from OSHA, nearly 20% of workplace fatalities occurred due to electrocutions, being struck by an object, or being caught-in/between a machine. With automated machinery, robots, and conveyors in most manufacturing settings, it is critical to separate people from these potential dangers. BeastWire Mesh Guarding systems can prevent these unfortunate circumstances from occurring with proper planning and engineering. For example, using BeastWire as a pedestrian barrier guard allows a manufacturer to dictate the flow of foot traffic throughout their facility preventing employees and guests from entering areas that have a higher risk of injury. As robotics systems continue to proliferate in the manufacturing and industrial sector, it is imperative to use proper safety measures to protect property and personnel. The Robotic Industries Association (RIA) and US Occupational Safety and Health Administration (OSHA) have created a similar set of guidelines and requirements to protect personnel from potential hazards caused by robots or other machinery. An effective safety system protects those that might encounter a robotics system including engineers, maintenance workers, and operators. The distance determines the allowable openings in the steel mesh to the hazard. Standard BeastWire welded wire mesh can be used within 17-1/2” from a danger line and are available in smaller mesh sizes to get closer to the operation when space is at a premium. BeastWire Mesh robotic work cells further use posts with 2” standard sweep space which is less than RIA and Canadian standards requirements. In areas where hazards are more extreme, BeastWire interlocked barrier guards provide an excellent solution to keep personnel safe. These enclosures surround robotics or other automated equipment, and the doors come equipped with integrated safety interlocks. On robot operations and associated machinery, these interlocks will automatically shut-off when a door is open. Likewise, combining a presence sensing device, such as a light curtain, adds another level of safety and security. To keep items from falling from the top of a mezzanine, pick module, or other elevated work platforms, consider BeastWire RailGuard which is a fully integrated handrail system complete with optional kickplate. 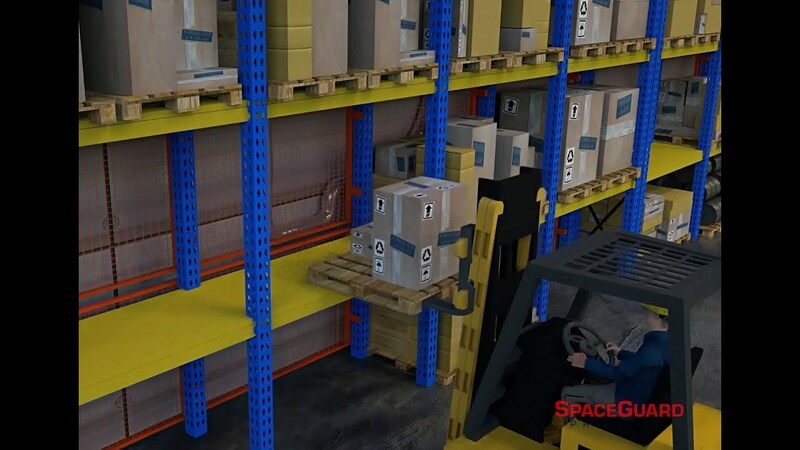 Or, for full height coverage, consider BeastWire security cages designed to fit above or below a mezzanine system to secure tools and inventory. 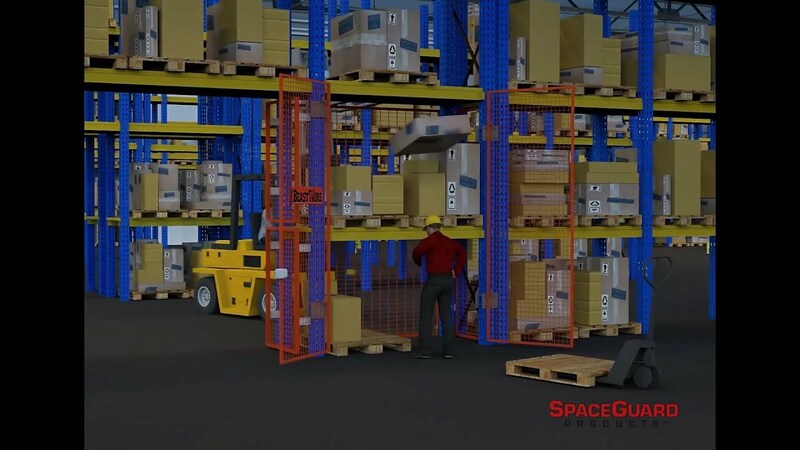 Tool Cribs and wire mesh inventory cages provide maintenance personnel with a designated and secure location to store and organize tools and parts. Tool cribs protect against theft and help save money by controlling inventory. BeastWire Mesh panels offer easy visibility allowing personnel to see inside and outside of the cage. These wire mesh enclosures are modular in design and can be quickly configured to fit your space. We stock slide up service windows built into BeastWire Mesh panels for quick ship. Let our customer service team help you secure, guard, and protect your manufacturing facility. Contact us today. 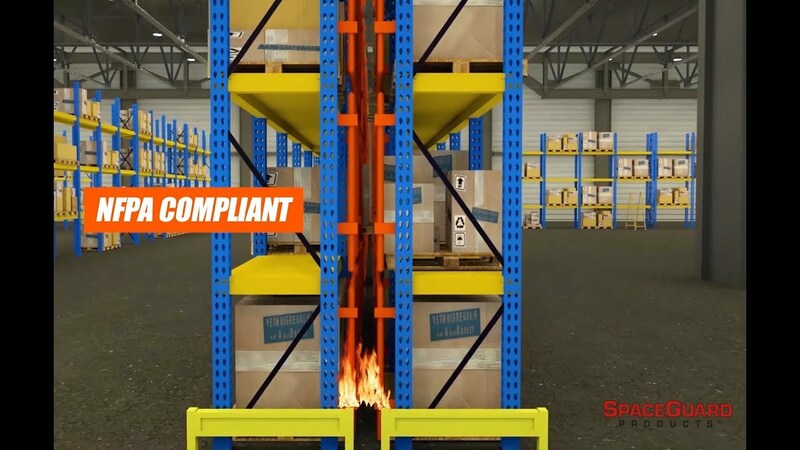 Learn how to prevent common workplace accidents, avoid facility and warehouse structural damage, and avert costly fire damage while staying NFPA (National Fire Protection Association) Compliant. The BEAST Secures Kong for Another Day! Copyright ©2019 SpaceGuard Products. All Rights Reserved.